I think we possibly have a future motocross/aerialist star on our hands. I am not proud. In fact I would love to rid our home of all motorized toy vehicles! I have always been a "use your own legs" type. 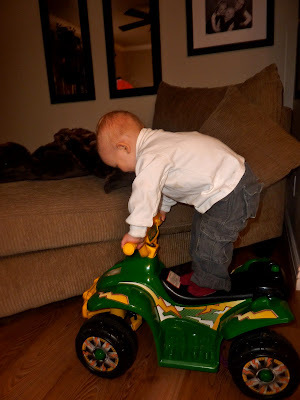 But clearly Emmett feels like he is an ultra cool guy riding back and forth through the kitchen, doing his "tricks." Did you take him to the ATV exhibition? I swear that was a move I saw highlighted on the news.